Last week, I missed my "week in review" post. Because I was out of the country! Shane and I, with the MAJOR help of my mother who kept all four of our children, took an amazing 6 night cruise to the Eastern Bahamas. It was absolutely the best time in my life. Those that have known me for a while know that Shane and I have been fortunate to have been on many trips, because I was a PartyLite leader and consultant for several years and earned many trips to some exotic places (Cruised to the Bahamas, went to the Atlantis Resort on Paradise Island, and went to Hawaii--twice. Once to Oahu and once to the Big island.) But this trip far outdid those other ones. Shane and I, on the plane, headed from Indianapolis to Ft. Lauderdale! Our hotel in Ft. Lauderdale--very beachy! we went with our wonderful friends, Tom and Jen! but it was so special for ALL of us to be together as well! I ordered the full Red Snapper. It may look strange, but it was delish! The next morning, it was off to board the ship! We got on with no problems, and headed straight to the cafe to have lunch. It was the most amazing view! We were 14 stories in the air. This picture is for my mother, who was afraid I would fall off of the ship. See mom? All the railings were to my shoulders! You had nothing to worry about! that you can see in the picture above! :) I was the King of the World. Ahem. Taken in the arcade for my little Mario Kart lover, Ethan! ...and right by that was the rock climbing wall, basketball/volleyball courts, and ping pong tables. That night, we had our very first dining experience. Cruises have the BEST food! And, great shows, too! A comedian that we got to see on two different nights. but the sun was SO bright. Shane and I were laughing so hard! That day, we didn't do too much. I'm a lounger on vacation. Shane is more of a do-er, so it was good that he had Tom and I had Jen. They went and played basketball and air hockey in the arcade while we worked hard on our tans. Later that night, we had our first 'formal' dinner. It was so fun getting all dressed up! We decided to hit another show, but snapped a couple of pics first. This one is one of my very favorites from the whole vacation! We found an awesome little 'club' on the 14th deck that was empty, and decided to play some cards. Little did we know how much time we would really spend there! We played almost every single night and had a blast. took little boats (called tenders) to shore. Got a great shot of our ship! Grand Cayman was very beautiful, and very clean. We found a gorgeous part of the beach where there were very few people. This beach, called Seven Mile Beach, is one of the top 10 most beautiful beaches in the world. We could see all the ships docked--there were four or five that day. .... while Shane decided to play. Having a great time, but still missing our babies! We went on a seashell hunt for the boys. ....and then enjoyed the water for quite awhile. We were supposed to "snuba" in Grand Cayman (a cross between scuba diving and snorkeling) but because of dangerous conditions, the excursion was cancelled. We were so disappointed, but made the best of it by exploring all the little shops and stands. I got to try my very first real coconut. Back on the ship, and time for dinner again! This night was casual. After dinner, we changed clothes, snapped a couple of pictures, then headed off to another show. We went every night, and they were all good! caught fish that were about the size of sardines! Next idea: jumping off the pier. That fun lasted for quite some time! Shane in over his head; Tom still touching. It's deep for the shorties. After a while, they were waaaaay out there. When the 'calm' swimming got boring, the boys went in search of some more adventure. Shane taught Tom a game he likes to call 'thrashing'. Basically--you sit where the waves break and let them crash on you. I was just floating for a while, and Shane kept telling me to take off my glasses. I knew if I did, I wouldn't be able to see, and plus--I was staying way away from the breaking waves, so I just kept floating while wearing them. Well, all of a sudden, without really thinking, I decided to ride one in and lost my glasses right off my face! Ugh....that beach did some damage, for sure--but was so fun in the process. There was lots and lots of sand in lots and lots of places! And it turned out, after about an hour, to be the most beautiful day of them all! Eating some lunch. A Jamaican feast, including some VERY good Jerk Chicken. And, yes, I am squinting....I couldn't see! 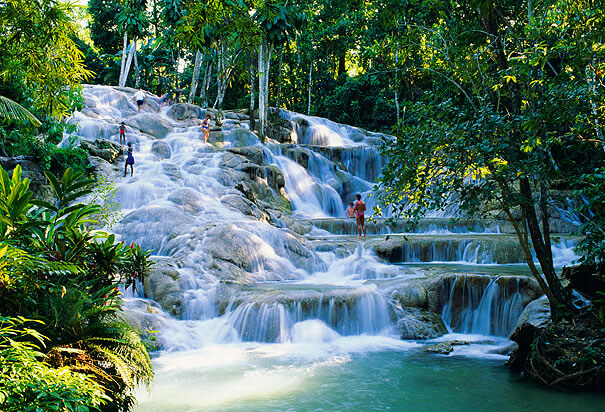 After lunch, we went on the best adventure--climbed to the top of Dunn's River Falls. Below is a stock photo, because clearly, I needed my hands to climb this, since I didn't have my eyes! *giggle* Tom took lots of great pics with his underwater camera, though. It was so, so much fun and beautiful! including Last of the Mohicans. This is only a very small portion of the falls. posters were in the hallway, right outside of our stateroom. This night was "semi-formal", but another opportunity to get dressed up? I took it! Yikes! Talk about picture overload....the second half of the cruise will have to wait for another day! Devin, I lived vicariously through you while reading this post!! I love the beach, it's my all-time favorite place!!! 20th anniversary, which also happens to be the same year I turn the big 4-0!!!! Looks like you guys had such a good time and I really enjoyed this post!